everywhere, and forever. But it’s not. 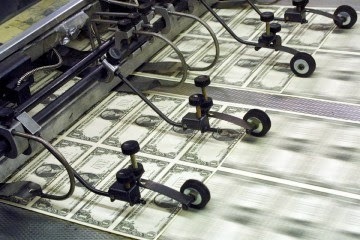 A lack of inflation, in fact, may be part of why our nation’s economy can’t seem to get any momentum. This is rarely discussed outside of econ arenas, so I was happy to see this story (via the AP) on inflation in the Salt Lake Tribune yesterday. First, I'll flesh out their list of inflation’s benefits and then show that, despite the frequent cries currency debasement the last few years, inflation is currently at historic lows. 1. Inflation makes people and corporations more eager to spend money. As the value of one’s cash pile dwindles because of inflation (think Apple’s pointless $150 billion stash), one looks for investments and expansion projects in a hurry. 2. Inflation erodes the value of debts that are in nominal dollars (ie, not linked to inflation—think mortgages and most debt in America). While the payments stay the same over time, with higher inflation (and the wage inflation that comes with it), the country would more quickly erase much of the debt and underwater mortgage overhang from the crises of 2009. 3.In a recession, if wages were able to fall it would help the job market to clear (ie, jobless can find jobs) and for the economy to more quickly be restored to full employment through lower labor costs. Economists debate how sticky (or flexible) nominal wages actually are. If inflation were higher, employers could more easily reduce real (ie, inflation adjusted) wages by not giving raises, while not lowering nominal wages (which is hard). While it sounds bad to take a pay cut, this would actually help produce higher wages in the end via a more dynamic economy. 4. The Federal Reserve lowers interest rates (ie, makes money cheaper) in bad times to stoke the economy and raises rates in good times to ward off inflation. With the recent crisis, the Federal Reserve has lowered rates all the way to zero (where they run out of this kind of ammunition). If inflation were higher, the Federal Reserve would have more room to cut (and could actually turn real interest rates negative), as nominal interest rates are naturally higher with higher inflation. Negative real interest rates means one would actually be paid to take out a loan (to start a business, expand their company, etc). It’s weird. Instead of people calling for such measures the last few years, we’ve actually had a large number of people worried about money debasement and inflation that’s too high. Looking at the data, this is silly. The figure is from the awesome FRED website. 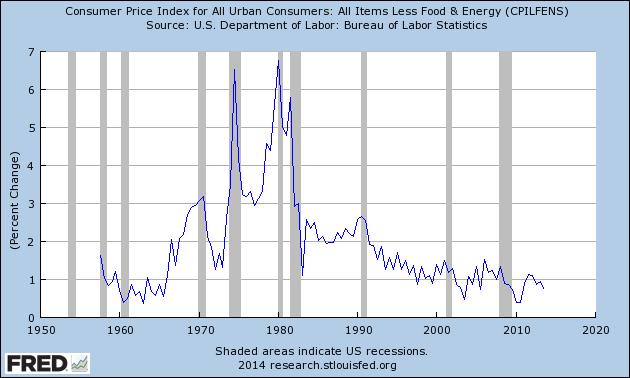 Note that inflation is currently lower than it’s been in ~50 years. Based on the 2% inflation target the Federal Reserve has set and the benefits of inflation laid out above, we could actually use more dollar debasement around these parts.